Below is a list of the software currently supported by the University of Missouri’s ACT Center. Each company has their own support system (linked below), but if you need individual assistance, contact the ACT Center. Co:Writer is a word prediction software that works in conjunction with any application you write in like MS Word, Web Browsers, Google Docs, Blogs, Email, and more. As you type, Co:Writer interprets spelling and grammar mistakes and offers word suggestions in real time. Dictate and transcribe documents with a fully customizable experience that optimizes speed and accuracy. Read selected texts from any other application, import texts in several formats and listen to them on the go. JAWS, Job Access With Speech, is developed for computer users whose vision loss prevents them from seeing screen content or navigating with a mouse. JAWS provides speech and Braille output for applications on your PC. NaturalReader is a text to speech software with natural sounding voices and can convert any written text such as MS Word, Webpages, PDF files, and eBook into spoken words. NaturalReader can also convert any written text into audio files such as MP3 or WAV. OpenBook converts printed documents or graphic-based text into an electronic text format on your PC using optical character recognition (OCR) technology. 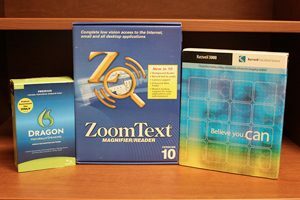 Software that includes screen reading, speaking thesaurus, word prediction and phonetic spell checker. Screen enlargement software with the ability to read aloud anything on your computer screen.